In general, the average person’s profile tends to stay fairly consistent over time. While small differences in results from one time to the next may occur, major shifts in style are unlikely. Do specific professions, cultures or nationalities trend towards one dimension or another? You may have noticed that you see more of one dimension over another when you do trainings with different types of groups. This does occur, but the distribution of successful people in each dimension is still pretty evenly distributed. We don’t see much difference in DiSC results based on region of the US. In fact, I had just done a comparison using some representative states (CA, DC, FL, IA, NY, OH, TX, CO, GA) and found very few differences. There was a very slight tendency for results like more S styles in Ohio or more D styles in Georgia, but these differences are so small that they have virtually no practical implications. With regard to ethnic difference, we can also say that we don’t see any differences based on the traditionally defined five U.S. categories. In fact, when we look at a large sample of Australians (living in Australia) who have taken the U.S. profile, they look the same as the US population. I would only expect to see a difference in your sample with a large Latin-American population if participants are not very fluent in English. In such a case, the distribution of scores shouldn’t change, but the precision will drop a little. You might have heard someone dismiss someone’s action or comments with a remark like “She’s a D, what do you expect?” Assigning labels and rationalizing poor behavior is not what DiSC profiles are about. For one thing not all Ds behave or respond in the same way. There is diversity in each dimension as you can see if you compare where someone’s dot falls in the D quadrant. 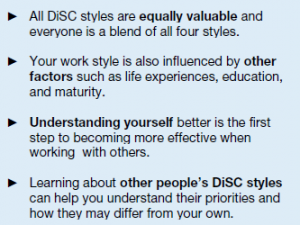 DiSC was designed as a way of helping people better understand another person’s preferences and priorities. It’s a tool to help each of us adapt our preferred, natural behavioral style to meet the needs of another, in a healthy manner. Choose the profile that best meets your needs. Choose from profiles focused on general workplace issues, management, leadership, sales, or conflict. If you want to learn more about yourself, we recommend Everything DiSC Workplace. You can be sure each assessment has gone through rigorous evaluation for validity, reliability, and ease-of-use. Learn more at Which DiSC profile is best? Is it uncommon to have an extra DiSC priority? I hear people say “I’m a High I” or “She’s a High D”. Isn’t it possible to be a low I or D? On my test I scored what is called the classic Creative Pattern, which has High scores in the D and C dimensions and Low scores in the I and S dimensions…how come I’m not referred to as a Low S? Yes you could be a low I or S. However, the classical pattern focuses on which of the D i S or C you have in segments 5-7. So if you have a D and C in these segments you are considered high D and C, or a creative pattern. You are considered low if you are in segment 1-3. Therefore, it would be possible to be a High C (in segment 5) and have your i in segment 4, which would not be considered low. Can your DiSC profile changed? To answer the question above, i think we can use the Modify form behavioral tools, is it right? I’m not sure if I understand your question about modifying your profile. Your profile can change as you mature or as you respond to different environments, but it won’t change drastically. Everyone is a blend of all eight styles, moving outside their own preferences to meet the needs of the situation. For example, Everything DiSC Sales teaches how to match the style of your customer to be more effective. We have two employees whose DiSC styles have changed dramatically over a short period of time. One employee’s style has changed from SC to D in an 18 month period. The other employee’s style has changed from S to Di in a two month period. Both employees have remained in the same jobs over the stated periods and have not experienced any apparent significant life or career events. How would you interpret these changes? Were they taking the same Everything DiSC profile each time; e.g. Workplace in January, then Workplace again the next year? It’s very unusual for such a change to occur. I suggest looking closely at the Everthing DiSC Supplement for Facilitators for each person. You might spot that the SC had unexpected items that fall in the D quadrant. I would also look at the company culture. Has it become more accepting or demanding of a D style? Sometimes people will answer as they think the person giving them the assessment wants. The S style tends to be thought of as being more traditionally appropriate for women, for example, and the D being too aggressive for a woman. I think a lot of us would like to be seen as a Di because there are rewards for that style of behavior in our culture. You’re know much more about these two employees. How do others see them? Have they observed a change in behavior? I recently retook the profile (twice) and found my profile has totally shifted since I took it last 16 years ago. While I was in sales leadership, I scored I, S with nearly no D and absolutely no C. After adopting a special needs child and quitting the paid workforce, I’ve shifted to a DC, with smelly inklings of and S. I’ve felt my fun vivacious self has given way to an advocate, I kiss my old self. Any comments why the shift? Or was it an evolution? Sounds like significant changes in your life have changed how you need to behave in the world or how you see yourself. Your difference might also be partly caused by how today’s adaptive testing used in Everything DiSC assessments makes them more accurate than the old DiSC Classic or even PPS 2800 you would have taken in the 1990s. Is there any research of US population using DISC assessment tests? Is it a high S/C population? 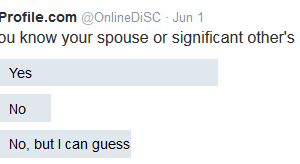 Everything DiSC was developed and normed on a representative sample of U.S. adults. Analyses were conducted to see if the distribution of styles differed across various demographic categories. Based on the norming of the DiSC assessment, the expected distribution is 8.3% for each of the twelve styles. I have done several disc assessments today and got conflicting results. I think I was a little bit skeptic about the first result and then tried to repeat it using different tools. Sometimes I would get a dominant D with high I and very low C, other times I would get a dominant I and high D with low C, one time I got a dominant C. Maybe I read too much information about it and now I just can’t give sincere responses to the questions and just mix up what I am with what I’d like to be and the things I have to do daily even if it is not natural to me. Anyway, it makes me sad and frustrated because it feels like I broke it and can’t use it anymore. We’re sorry to hear that. 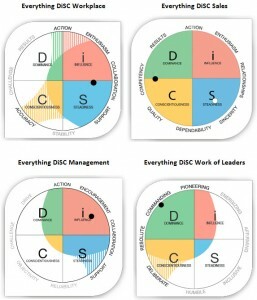 If you took another assessment using the DISC model, but not the Everything DiSC assessment, I’d encourage you to try Everything DiSC Workplace. The computerized adaptive testing provides more accurate results than available in DiSC Classic or one of the many poorly designed DISC tools out there. Also, getting to see an Everything DiSC Supplement for Facilitators will give you the ability to see if you have some answers that simply fall outside what is expected for a typical style. And remember, you can have more than one DiSC priority. The circle model shows this much better than does a chart. Hi, is it possible to get same percentage on D,I,S, and C? I have done the test twice before and got totally same on every letter on both test. The last test I took was last year. I redo the test last week, and I got almost same on all, just my D a bit higher while the others were. I took the test again today to make sure, I got almost same on every letter, but now my C a bit high. Is it weird? It sounds as though you may be using a variety of DISC assessments. Is that the case? Each DISC assessment is developed differently. A few, but not all, are heavily researched and validated as the Wiley DiSC that we offer is. While you may be strongly inclined toward a style on one assessment, another assessment may use different criteria, terms, values, etc which may give you a different result. I hope that helps you understand a difference in recently taken tests. There are a variety of other things that may be happening, but this sounds likely. I took the DISC assessment & did not score a 5 or higher in any category. I scored an equal “4” in both D & C, with my I & S being around -1. What would this indicate if none of the categories are above a 5? We can’t tell you anything about what it means if you took a DISC assessment that wasn’t either from the Everything DiSC® family or DiSC® Classic. Not all assessments based on the DISC model are the same. 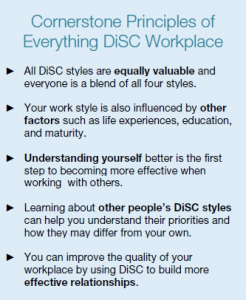 It sounds like you could get much better information about your style by taking Everything DiSC Workplace®. It places your style within a circle rather than giving you numbers that are hard to interpret. With Everything DiSC you would receive a personalized narrative that explains your style in detail. DiSC profiling suitable for youths with diagnosed special needs condition (ADHD, Autism)? Are there DiSC profiling tools specifically designed for them? Everything DiSC doesn’t have a profile designed for youths or anyone with special needs, however we can share some information that might help you make a decision. These quotes are from The Everything DiSC Manual. Debriefing the results might require extra care. Youth (and others) can sometimes worry that how they answered wasn’t how a popular kid would answer or they worry about being pigeon-holed with a style label. Of course, individuals behaviors encompass all four quadrants of the circumplex graph and that should be emphasized. We do still sell the I-Sight profiles that present DiSC in a positive, non-judgmental format for youth. The product has been discontinued, but you can contact orders@discprofile.com about ordering some of our remaining copies. You might want to post to the Everything DiSC User Group on LinkedIn and ask if anyone has used Everything DiSC with a similar population. Thank you so much for the advise! This is very helpful! Everything DiSC does not report on adaptive styles because researchers were not able to find evidence of any validity to this scale. Read why at https://discprofile.com/what-is-disc/disc-profiles-research,-reliability-and-validity-s/what-about-adaptive-styles/. Some assessments offered by others still use this scale because it was part of the original DISC model’s hypothesis of behavior. But it just doesn’t hold up to validity studies. Is DiSC profiling suitable for youths with diagnosed special needs condition (ADHD, Autism)? How would you advise for me to administer the profiling? Should you place employees with the same DISC score together? Example: If you have a crew of 3 construction workers would it be better to sort out the ones with same scores? Is it possible to have separate questions on each of the disc elements?. . .
I’m sorry, but I don’t understand what you’re asking. Hi, I did the classic 2.0 DiSC Personality test and my result was a Practioner, high C personality. I am just wondering what Personality style would I be most divergent from? Correction, I scored high iC demensions. What would be the most divergent to that? Look at the circumplex model for DiSC and you’ll see that across from the C is the i. You might be a C style with an extra priority of enthusiasm. The iC style is from the older graph model and that assessment did not use adaptive testing. You’ll get a more accurate profile if you take Everything DiSC Workplace. You might be interested in the article What happened to my style: iC or DS? I would suggest taking an Everything DiSC assessment since it is 32% more accurate than DiSC Classic. Of course, you could still have a similar even score. It happens. It can mean that the person is very adaptable. It can mean that the person wasn’t sure about the meaning of several words or felt that they had strong negative connotations. Asking others to “people read” you and describe what they have observed your style to be can sometimes be really interesting and helpful. Are there any statistics on the distribution of the four profiles? To me it seems there are way more S-personalities than D-personalities but this might be due to some kind of bias. Everything DiSC is normed so there is an even distribution of styles. D = 24.8, i = 25.1, S = 25.7, C = 24.4. There are other tests out there that use the DISC model and do not norm their assessments. It’s very possible that for those tests the results are skewed towards the S style. We only sell and support the Everything DiSC and DiSC Classic assessments, with Everything DiSC being the most accurate. What in the world does “good mixer” mean for item 23? I’m not sure what you’re asking. Are you asking about a question on an Everything DiSC or the DiSC Classic assessment? Can someone low in Dominance be a successful manager/leader? Of course. However they will need to learn to flex into the D style at times, just as a leader high in D will have to learn to flex into the other seven styles if they want to be effective. Learn more about the 8 DiSC dimensions of leadership. I’m very confused by this. I took the test last year and was a CD. Now I was required to take it again through work and have a D with a tie between I and S, with C being lower, but still pretty close to I and S. So what the heck am I? A DIS? My I, S and C are all really close to one another. 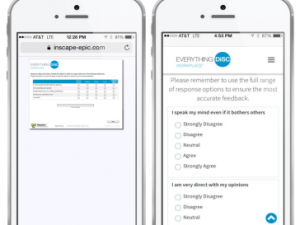 Did you take the Everything DiSC assessment? If you took someone else’s version I can’t comment. Most aren’t valid assessments. Since the DISC model is not covered by copyright, many people have created simple tests that give you a letter. One of those tests might give you a D and another might give you a C. If both the assessments you took were Everything DiSC products (look for the little i), I suggest asking your employer to show you the Everything DiSC Supplement for Facilitator report and go through that with you. It will give you a deeper dive into how you scored on each scale. It is possible for you to have one dominate style with two extra priorities. See https://www.discprofiles.com/blog/ufaqs/is-it-common-to-have-an-extra-disc-priority/ and https://www.discprofiles.com/blog/2017/03/disc-dot-priorities-explained/. So I’ve known I’m an infp for awhile and so much of it fits and makes sense to me. 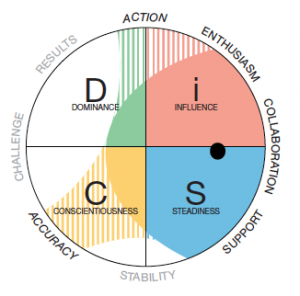 For work I recently took a DiSC assessment. I typed as a high C. I must say a “C” type seems contradictory to an INFP in many ways. First off Cs like facts -which I do but my feelings and intuition are just as important to me. Cs are rarely emotional unless under extreme stress. Um I’m emotional right now just sipping coffee and enjoying life lol. I’m wondering how do I reconcile these differences. The problem is I don’t see myself as any of the other DiSC types. When I’m at work I’m best when I’m focusing on details and completing tasks- which is very C but sometimes I daydream, feel emotional, have “gut instincts” etc. I guess I’m kinda bummed that I’m a C because due to my infp nature I think I’m a pretty lousy C. I mean if I was an engineer with a istp/istj I’d be a rockstar C. Compiling useful accurate data all day long. I guess my question is how can a caring emotional intuitive idealistic iconoclast be an excellent worker with a “C” type? Do I try to focus on the strengths of a C or attempt to become more like a D (intuition) or an S (caring emotional) type? I scored equally on D and S. I scored pretty low on “I” and don’t see the need to bolster those traits as that is very obviously not my style. PS I work as a registered nurse but have been offered a management position at my facility. Being a C isn’t all about data and accuracy. It’s about valuing these, but it also includes skepticism, which you seem to display in your comment. I don’t think there’s anything in DiSC that measures emotional feeling or it’s depth. An i might be more expressive, but not necessarily feel more emotions. A C can experience strong emotions, but is less likely to display them publicly. You say you are a “high” C and that’s not something we talk about with Everything DiSC. We talk about how close your dot is to the center or the edge, and about how inclined you are towards your style. See DiSC® dot and priorities explained. Perhaps you took DiSC Classic. The Everything DiSC assessments are 32% more accurate and the results might be more satisfying. If you took a DISC test not published by Wiley then we really can’t offer any insights into your results. As to how you can be an excellent worker with a C style, I think that’s something you might want to talk with your supervisor or a coach about. How common is it for two individuals to have the exact same read-out? It’s not commonly seen in a group, but it’s certainly statistically possible. It would be interesting to see if your Everything DiSC Supplement for Facilitators report is also exactly the same. Is there a way to redo the test anytime soon? My results were completely off, I feel like maybe it was because I picked neutral a lot since I didn’t know which applied to me. I want to take it again with the opinions of someone I know well. Where did you purchase your profile? If you took DiSC Classic you might want to take Everything DiSC Workplace instead since it uses a different questionnaire model–one that’s easier to answer with confidence. Did you discuss your results with a trained facilitator? Perhaps a facilitator could help you better understand your results. It’s unlikely that your DiSC provider give you another one for free, but you can always ask. Could you be a DS with an C shadow? Is that possible? Not sure what you mean by “shadow.” You might want to read What happened to my style: iC or DS? Everything DiSC doesn’t produce anyone with a DS style. You might be a DC with an additional priority in S.